Not only do they inspire innovation, they ensure that processes are in place to implement innovations. And they recognize they need to help their employees overcome the fear of change. Organizations with no vision for the future and no desire to change are heading toward obscurity and obsolescence. 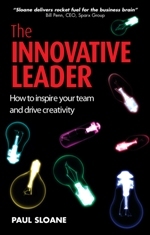 Paul Sloane has written The Innovative Leader for "the person who wants to turn themselves and their team into commanders of creativity and maestros of innovation." Vern Burkhardt (VB): You have been described as the "King of lateral thinking puzzles." How do you describe lateral thinking? 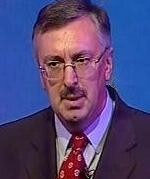 Paul Sloane: Lateral thinking is approaching problems from new or unexpected directions. It encourages us to move away from our established and predictable ways of thinking. By taking a different approach we can come up with new ideas. VB: You provide seminars on lateral leadership. What is meant by lateral leadership? Paul Sloane: It's the ability to think differently and to encourage your team to think differently, to enable your team to think of a problem in new ways. I give a lot of examples in the book. I used to talk about lateral leadership. I now talk more about innovative leadership because it's an easier concept to understand. People grasp the concept of being innovative. The purpose of lateral thinking in business is to find innovative ways to do things. An example I give in the book was when commercial TV stations were being auctioned in the early 1950s in the UK. Many companies wanted to buy a license for commercial television and they put teams of analysts to figure out which would be the wealthiest regions that would therefore generate the best advertising revenue because of demographics. Sidney Bernstein, the managing director of a little company called Granada Cinema, wanted to bid. He told his employees, "I want to bid but I don't want you to look for the richest region. I want you to look for the wettest region and let's bid for that." His people found that the wettest region was the northwest of England and they bid and got it dirt-cheap. He figured out that it wasn't so important to get the wealthiest people. It was more important to get people who had to stay indoors because it was so wet outside. You deliberately come up with a different perspective in order to think of a different solution. When everyone else is looking for the richest, you look for the wettest! VB: What are lateral thinking puzzles and how do they encourage creative thinking? Paul Sloane: They involve strange situations where you get a little bit of information and then you ask a lot of questions of somebody who knows the answer. It works well as a team goal, as a management training exercise, with children, after dinner parties and lots of other occasions. The really good puzzles give a satisfying feeling when you crack them. They test people's ability to check the assumptions we make when they hear about a situation. Every time we approach a situation—whether at work or in real life—we make assumptions. Sometimes those assumptions prevent us from generating creative solutions. With a lateral thinking puzzle the first thing you do is check all assumptions. You have to avoid becoming stuck with only one line of inquiry. You have to come at the problem from a different angle and then, as you ask questions, sometimes you'll come up with a solution. There is one solution that's written in the book for each puzzle, whereas for most business problems there are many solutions. But they do stimulate thinking about new ways to do things and they encourage you to think outside the confines you normally operate within. VB: Do the lateral thinking puzzles also train your brain to do lateral thinking? Paul Sloane: Yes they do. Every time you're looking for a sneaky approach, you're looking for a catch. You're looking for ways in which the situation can be viewed differently. You have to check all your assumptions. You have to ask a lot of basic questions to make sure you're not assuming something you shouldn't. And it applies in business. The lateral thinker, the innovative leader is someone who asks a lot of basic questions and challenges all the assumptions that people in the business make—whether it's an airline or a movie business. The people that ask basic questions and challenge the ground rules that everyone else takes for granted are often the major innovators. VB: Since 1992 you have written eighteen books that contain lateral thinking puzzles. Do you use lateral thinking when designing these puzzles? Paul Sloane: Yes, I'm always on the lookout for a different way of looking at things and when I read about a situation I always ask myself how could this be stated as a lateral thinking puzzle. Some come from examples in business, strange things I come across, crimes and many other aspects of life. If you look through the books you'll see there's all sorts of weird things in them. Children love them and often do well with them, because they don't have all the preconceptions that adults have. VB: So children are more adept at lateral thinking? Paul Sloane: I think so, because children are more imaginative and the better at asking questions. Children are tenacious questioners and they keep asking and will keep looking for different things. It's good training for children and many teachers use the books in their classes. Lateral thinking puzzles can be rewards for children after they've completed their regular exercises and tasks. VB: Are any of your lateral thinking puzzles your favorites? Paul Sloane: Yes, I've got quite a few favorites. For example, a man took off his shirt to go to bed and thousands of people lost their jobs as a result. How could that be? You have to ask a lot of questions to figure out what's going on because the solution's not at all obvious. But there's a very satisfactory solution. The puzzle is based on a true story. A man really did take off his shirt to go to bed and, as a direct consequence, thousands of people did lose their jobs. VB: Is there a relationship between being a major innovator and being successful in business? Paul Sloane: It's one of the elements of success in business. To simplify, you can have a business model that works, so you streamline processes to produce the goods or services more efficiently and effectively at reduced cost. Your business must work efficiently and deliver added value to your customers. That's the improving-best-practice model, which is what total quality management is about. But that will only take you so far and then you top out on the S-curve. You have to mix streamlining and quality improvement processes with innovation. You have to find new ways to do things but not every innovation works because innovation by its nature is risky. Quality management and innovation management require different attitudes and different skill sets. Quality is about limiting variation and making things predictable. Innovation is about introducing variation and trying the unpredictable. Leading innovation involves a paradox. Part of the time you must be really passionate about efficiency and making the current model work better. Other times you're looking to compete and replace the current model with something entirely different. VB: A dilemma facing successful companies is the fear of change—the reluctance to take risks and try new things. You advise against relying on customer feedback surveys to determine how well a firm is doing, because the response predictably will be that customers will say they want more of what you offer but they want it better, faster, and cheaper. Indeed you advise that companies should instill "an attitude that allows you to compete with, threaten and even make your leading lines obsolete—before somebody else does." Is this one of your key messages? Paul Sloane: Yes, definitely. You've got to be prepared to cannibalize your best-selling product. Clayton Christensen talks about generating disruptive growth. He cogently points out that the innovator's dilemma is that it is very difficult for really successful companies to be truly innovative because their success blinds them. They listen to their customers, which you would think is a really good thing to do. The customers say "we like what you've got." Keep making the same products and do it better and quicker. Make the products easier to use, lighter, offered in different colors or whatever other features they can think of. But the customers don't say we want an entirely different way to do things. There are many examples of companies that listened to their customers, improved their products, improved efficiency, reduced production costs, improved customer service and went bankrupt. Something new comes along which kills them. Clayton Christensen advises and I advise that you've got to be constantly trying new things and deliberately experimenting with new ways to provide added value to your existing or to new customers. You can't rely on your existing customers to always help you with innovations to be brought to the marketplace. VB: If you only listen to your customers to guide your business model you end up with incrementalism—trying to become incrementally better when, in fact, technology or your competition may pass you by. Paul Sloane: Absolutely. There are many examples. One of the examples I give is if we were a manufacturer of spectacles in the 1950s and had surveyed 10,000 customers to determine how we could make our service better. They might have said you could develop plastic lenses, scratch proof lenses, titanium frames, or bendy frames. What would they not have asked for? They would not have said, "I want you invent something that I put on my eyeball every morning." Nobody would said—not one in a million would have said—I want you to cut through my eyeball with laser beams to change the geometry of my eyeball so I can see better. A spectacle manufacturer would be asking customers questions related to spectacles customers would not have been thinking in terms of how to improve eyesight. If, rather than focusing on improving spectacles the question asked was how can we improve eyesight, the big innovations of contact lenses and laser eye surgery would be more likely to have emerged in our thinking. If we had asked how can we find a different way to add value for our customers, we might have had a different approach to innovation. VB: You identify a number of approaches to generating innovative ideas. Such as studying in detail how customers use products and services and the problems they encounter with them, co-creating with customers in order to benefit from their creative minds, creating online communities to encourage user generated content, and crowdsourcing. Are these types of approaches increasingly going to be the source of innovative ideas for successful companies in the future? Paul Sloane: I think they are. Many leading companies are putting enormous efforts into open innovation, where they'll look deliberately outside the organization for ideas. Procter & Gamble are famous for taking this approach. It has a Director of External Innovation whose job is to source 50% of Procter & Gamble's innovations from outside the company. Most of the major, fast-moving, successful companies have a similar approach where they are actively looking outside, because they know they can't generate all of the innovations that they want internally. Open innovation is very much the passion of these companies. It's about finding ways to encourage people to bring you the ideas you want—not just any idea—ideas which are well-formed or are partly solved, and then protecting their intellectual property. That's the tricky part, because most people who come up with an innovative idea are terrified that Procter & Gamble is going to steal all their intellectual property. Finding a way in which you can license those good ideas and bring them to market quickly is the trick. The leading companies are getting very good at doing this. VB: Are you saying they don't necessarily ask for exclusive rights to the intellectual property? Paul Sloane: They are very flexible. They'll say we'll make it, we'll license it, or we'll go into a joint venture with you. They are open about how to do it. What they don't say is that you've got to sign a non-disclosure and whatever you give us immediately becomes our property. They are not as dictatorial as they used to be. They give very clear guidelines. They give a set period of time in which they will decide and advise whether they will use the innovation. They acknowledge if they decide to not proceed the inventor can take it to anyone else. They have clear guidelines and have cracked the problem of how to work with a small inventor. VB: You even suggest that we should fear success because it leads to complacency and therefore to less innovation. Paul Sloane: That's right. Successful companies tend not to be the innovators in the next generation. Somebody once said that innovation comes from two things: pain and slack. Pain causes you to innovate. If you're in your comfort zone, you're doing well, making money, customers like you, they like your products, and you think you're really smart. You think you're doing everything right. Why change? The motivation is to keep doing what's working and it's very hard to be disruptive and counter-cultural in that environment. But if you're feeling pain or if your customers are feeling pain, that's a good source of innovation. The other source of innovation is slack. By that I mean you've got to give people some time, money and freedom to try things. If everyone is working flat out all the time on a day job there is no time to try new things. That's why companies like Google and Genentech deliberately allocate time for people to play around with any idea that interests them in order to see where it leads. You have to give people a bit of free time in order to achieve innovations. VB: Do you think the younger generation, the N generation, coming into the workforce is more adept at innovation and creativity? Paul Sloane: I'm not convinced that is the case. Our education system in the Western world does not encourage creativity or development of an entrepreneurial spirit. It encourages people to pass exams and to memorize until we regurgitate knowledge which is not what innovation is about. Young people have a natural creativity and natural imagination but most school systems crush out a lot of those wonderful traits. Then when they enter the workforce it is often also discouraged because their ideas aren't sought, they aren't encouraged and they aren't challenged. I don't think young people are the source of innovation that they should and could be. By the same token, we shouldn't generalize that older people are set in their ways. Sometimes older people are very innovative and very entrepreneurial. I don't think there's a clear pattern. VB: The process of innovation involves abandonment and renewal of more than just the products and services offered to customers. You advise that in recognition of the constant change in technology and competition a business also needs to plan for replacement of its systems, methods, business processes and practices, and business model in order to achieve a competitive advantage—to leapfrog the competition. Should the ability to leapfrog the competition and generate radical new approaches be the major mantra of business leaders? Paul Sloane: It should be one of their mantras. It depends what phase of a business cycle you're in and what you're doing. Innovation is very important but it's not the only thing that's important. But if you don't innovate you run the real risk that you'll slip behind and lose your edge. The only way the Western world is going to be able to compete with the Eastern world is by innovating, by finding better designs, better routes to doing things. We're not going to beat them on price, cost-cutting, efficiency, or quality; but we can beat them on imagination, creativity, design, brand and different ways to do things. We've seen this particularly in the USA with the Internet revolution and the way that has re-energized whole sectors of the economy and enabled people to do things in entirely new ways. What was built was a completely new business model which nobody had conceived before, making many businesses world-wide business leaders. Amazon is but one example of many new approaches that are being taken. Innovative people who can put together technologies in new and different ways with different business models can find new ways to add value for customers and gain enormous advantage. VB: Are you seeing that in Britain and Europe as well? Paul Sloane: All the time. It's wonderful to see. VB: You recommend businesses define themselves not by their products but by the benefits they deliver to their customers and how they can extend that value. Would you talk about how this contributes to innovation and business success? Paul Sloane: This is absolutely crucial. When I went to university and took an engineering degree we used a slide rule. Slide rules were wonderful things. The company that made them was called Thornton and they made wonderful slide rules. They thought their only business was making slide rules. But, of course, graphics software came along and killed them stone dead. If they had seen themselves as in the business of solving technical problems, they might have seen the possibilities that graphics offered. Similarly Smith Corona made beautiful typewriters and their customers loved their typewriters. They made them better and better over time but eventually word processors came along and eliminated the need for typewriters. Wang was the dominant company that made word processors and it was killed when that functionality could be taken off a dedicated machine. Now it's part of software on a personal computer. Instead of saying we're in the business of making typewriters, if Smith Corona had said we're in the business of helping people communicate with the written word they might have seen the other possibilities. It's about defining what you do in terms of the value you add. The people that made horse-drawn carriages were really in the transportation business. Yet none of them made the move to automobiles, because they thought automobiles were a new fad that wouldn't last. Horse-drawn carriages were beautiful, high quality, and didn't break down. They were right but missed the opportunity entirely. The key question to consider is what's the real added value you provide and is there a different or better way to provide it. By the way, there always is a better way. There is always going to be a better or different way to deliver what you currently delivery. It is a question of constantly looking for it internally and externally. Not only should you be looking to invent the new ways yourself, you should be on the lookout for what's happening in Hong Kong, Singapore, Holland, Australia, Brazil, and in other industries. Ask whether we can pinch the ideas that are currently working in the flower distribution and use them in the pet food distribution or other businesses. Ask who else has got a similar problem? Who else is doing what we need in a really slick fashion? That's where you can pinch their idea and use that as a source of innovation. One of the things I advise is borrow with pride. Find things that work and try them in your particular market and your particular industry. And see if they work for you. VB: Don't be afraid to cheat. Paul Sloane: Don't be afraid to cheat. I speak on the business circuit and encounter leading sports people doing the same. Sports people talk about how sports has a lot of things to teach business, but I don't think it does. Sports has a lot of fixed rules and you can't cheat. If you're found cheating the referee or the umpire will stop you. But in business you can do all sorts of things. You're not restricted to eleven or fifteen players on a field. You can dedicate as many resources as you wish and feel your business can afford. You can change the rules of the game all the time. Your customers decide whether you win or lose. If you invent a new game that they like then they will reward you. VB: You can move the goalposts. Paul Sloane: You can move the goalposts all the time but in sports you can't. In sports there is teamwork, discipline and practice, but they miss a major part of business—which is about moving the goalpost. VB: You say there are many opportunities for lateral thinkers to create new ways to provide the goods and services customers want. Would you explain? Paul Sloane: It's a similar thing. It's like the spectacles or the contact lens or laser eye surgery example we talked about earlier. If you'd been making buttons in a factory one hundred years ago, you'd designed new buttons and new ways to manufacture them. Eventually someone may have come to you and said "I've come up with an amazing way which you can zip things together with two strips of metal. It doesn't work really well at the moment but if you spend some money on it I'm sure it would work." Most button manufacturers would have kicked such a person out of their premises because they made buttons. They wouldn't have understood something as stupid as a zip fastener. They'd have been convinced it would never catch on because it would have looked clunky and ugly. And initially it would be more costly than buttons, which were cheap and easy to install&mash;so why change? Later somebody invents Velcro and there would be the same tendency to reject this new idea as well. Lateral thinkers are constantly looking for a new way to do something. They're always dissatisfied with the current method and they're always looking for a better way. They're not prepared to just make a better button, a good fastener, or a Velcro fastening. There will be something else to replace them. In fifty years time people will look back and say, "in 2008 they were still using old-fashioned Velcro and not the much better fastener we use today."